When I heard that the sommelier at Le Bernardin will be opening up his own little wine spot, Aldo Sohm, near by in Midtown, my ears perked up. We so desperately need some good options in midtown for drinks with clients or colleagues and Aldo Sohm sounded like it might just fit the bill. I knew that a spinoff of Le Bernardin led by their sommelier would showcase an impressive wine list but what I didn’t expect to find was a great leisure lunch spot offering light yet elegant fare. JZ and I were due to catch up over lunch and Aldo Sohm seemed like the perfect spot for us to convene. The elegantly simplistic dining room was quiet that rainy fall day when we dashed in but it soon filled up with Midtown lunchers seeking for a good bite. We decided to have a leisure lunch and start with a small selection of meats and crudite. 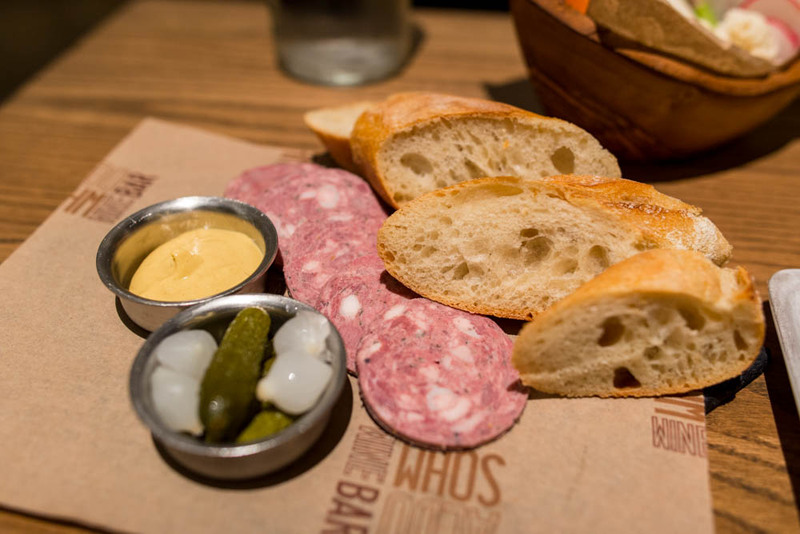 The cured meats were served with Maison Kayser baguette slices and a pungent mustard. The crudites were all delicate and stood attention in the basket, arranged elegantly. 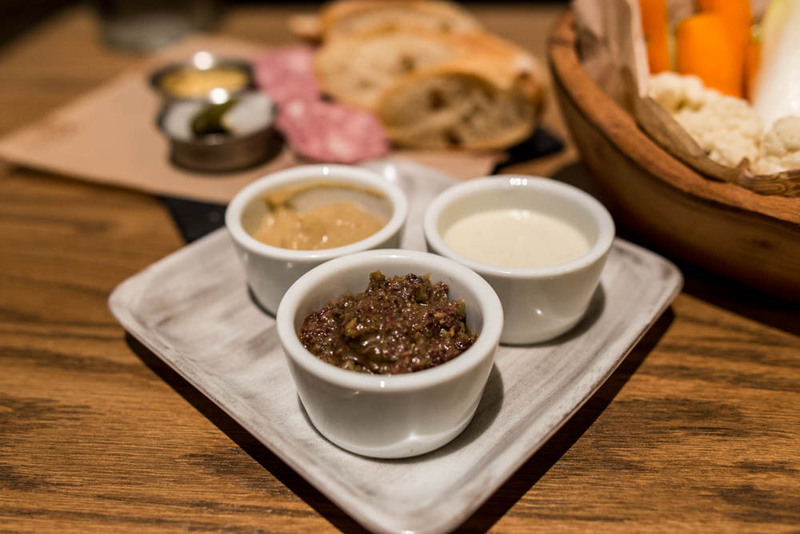 Served with a tapenade, a bleu cheese and a babaganoush dip, there are enough options for all types to enjoy. We shared a bowl of creamy sweet corn soup, a special at the end of the summer season. 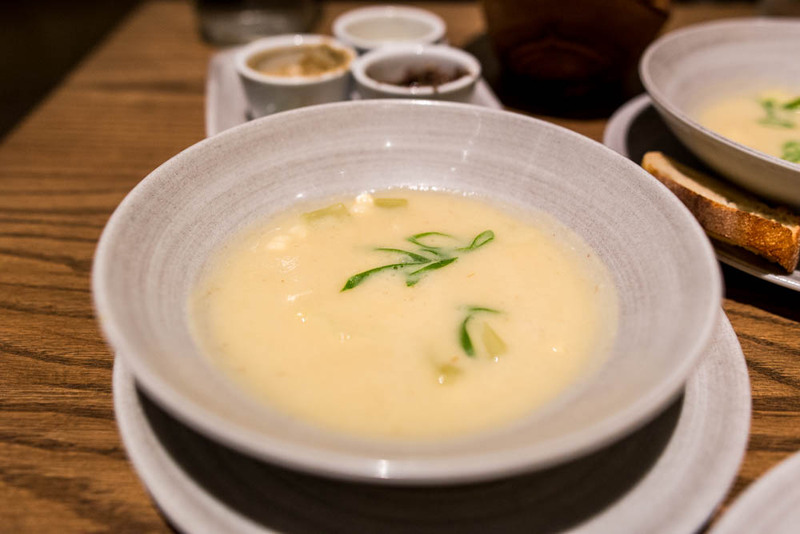 The soup was blended until silky smooth and was perfectly balanced between sweet and savory. The lunch menu at Aldo Sohm included a variety of sandwiches and salads in addition to the offerings at dinner. We were both drawn to the nicoise salad and the duck confit salad so like good friends, we were happy to share with each other instead of having to force ourselves to make a tough decision. The nicoise featured deliciously light preserved tuna over a bed of baby red leaf, green beans, potatoes and cucumber. 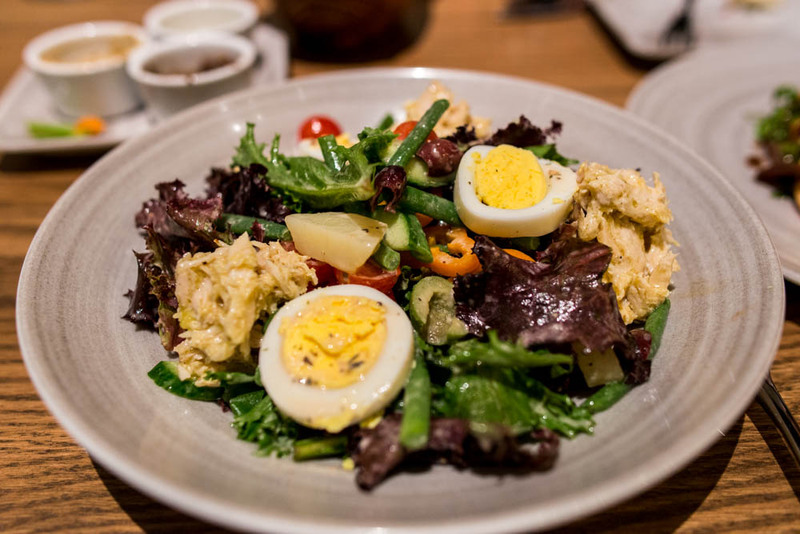 With a few slices of hard boiled egg and olives in true nicoise fashion, the salad was finished with a lemon dressing. The warm duck confit salad might have sounded more filling but it was also surprisingly light. 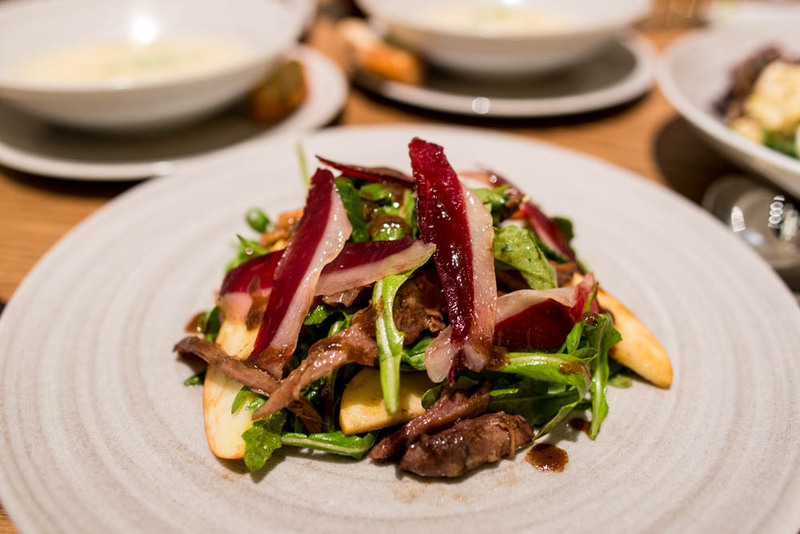 With a base of arugula, tender duck confit was accompanied by translucently thin slices of cured duck that was almost a ruby red. A sweet vinaigrette of shallot-red wine finished this Fall salad. We were ready to forgo dessert but then our waitress convinced us to stay just a little longer. 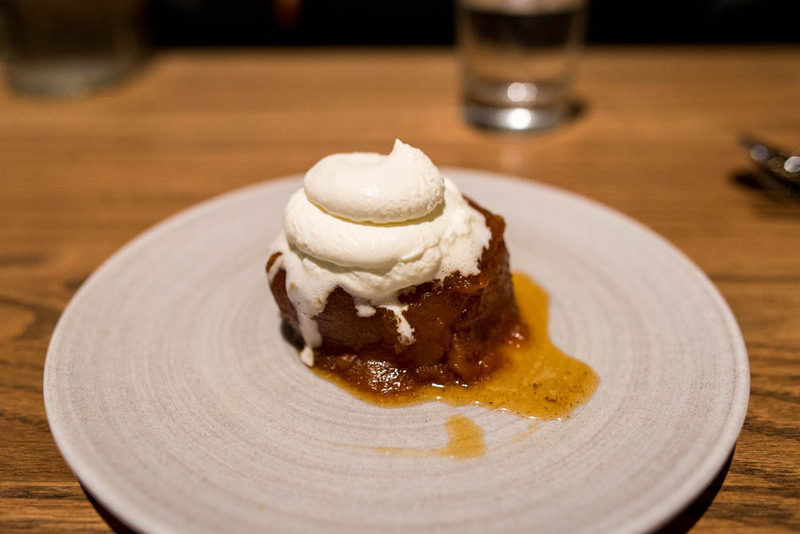 We were more than happy to share an order of the caramelized apple with whipped cream. The unbelievably soft apple was a deep amber color evenly throughout and the flavor was a subtle slightly burnt caramel, surprisingly restrained in the sweetness. The whipped cream on top was left unsweetened to let the pureness of the apple shine. Does it really count as dessert if there was only fruit? I have no problem believing this harmless lie if it meant that I could have this all the time.